Vicks Baby Rub– regular vicks is kind of strong, but my guys don’t seem to mind this stuff. I love the smell – it has more of a lavender/rosemary scent than regular vicks, and they don’t gag the whole time I put it on. Hot Spiced cider – we have been living on this and Chicken Soup all weekend. I get the Martinelli’s Apple juice, and add a couple teaspoons of mulling spice mix, heat in a saucepan or microwave. Chocolate – Crazy as it sounds, chocolate has a chemical that helps suppress coughing. A mug of REAL hot chocolate before bed and we have all been sleeping pretty well. Apple Cider Vinegar – if you can handle it – I barely can – one ounce of apple cider vinegar (organic, unfiltered – I use Bragg’s) 3 times a day will not cure your cold, but definitely shorten it’s duration. Warm Jammie Pants – ’nuff said. Although I got a couple of REALLY cute pairs at Target – these and these. Cute, huh? Needless to say I have had to ride out this cold without my beloved Advil Cold & Sinus, so Nyquil and DayQuil have had to pick up the slack – not well I might add, but that and a little sunshine are working wonders! « The Front Room Giveaway winner! So sorry to read this… esp the monthly visitor addition! Be well soon. Love the pic attached to your post! 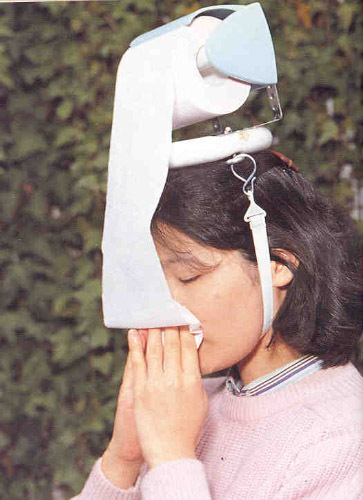 That is a brilliant invention for those who suffer with runny noses! Hope you and your brood feel better soon!